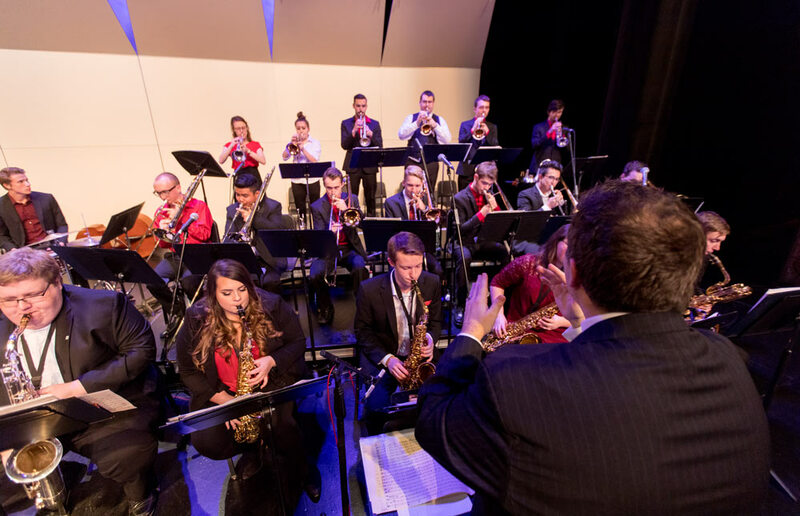 The U of L Jazz Ensemble performs an eclectic mix of repertoire including contemporary and vintage big band jazz music. The band consists primarily of music majors as well as other interested students from a variety of disciplines. Each year the band performs several times, both on and off campus, and makes a point of performing for school audiences, and conducting workshops with school groups whenever and wherever possible. The band also enjoys collaborating with a wide variety of guest artists. In recent years, the band has shared the stage with our own Fine Arts faculty Dale Ketcheson, Joanne Hounsel, Patrice Jegou, and Adam Mason; school and community groups such as the Lethbridge Big Band, the Lethbridge Collegiate Institute Vocal Jazz Choir; and a number of local high school jazz bands. Concerts have also featured several of Canada's top jazz musicians, most notably, alto saxophonist PJ Perry, trumpeter Don Clark, and tenor saxophonist Pat Belliveau. Sign-up sheet for auditions will be posted outside W752 in the University Centre for the Arts at least one week before the audition. Previous ensemble members do not need to re-audition, unless attempting to move in the section or instrument. If you would like to stay in the ensemble without re-auditioning please send an email no later than Thursday, September 6, 2018 at 5:00 pm. Prepared piece of your choice demonstrating a jazz style. This can be a transcribed solo, etude, or previous ensemble music. Possible sight-reading and improvisation demonstrations may be requested. Be prepared to demonstrate comping in multiple jazz styles. This can include transcribed solos, etudes, previous ensemble music or jazz standards. Rhythm instruments are provided at the audition if needed. *note – Piano will be the only rhythm instrument provided at the audition. Bass should be acoustic, guitars must bring amp, and drums must set up alternate time with the instructor.